Is the Phaistos Disc a Forgery? Not a single example of the stamped or ‘printed’ method of writing of the Phaistos Disc has been found in the numerous excavations carried out on Crete over the past 100 years or so. This complete lack of comparative material has suggested to some that this Disc is a forgery. Something that adds to the feeling of unease about the Disc’s genuineness is that specialists in Mediterranean and Near Eastern archaeology seem unwilling to get involved in the debate about the artifact. Dr Jerome M. Eisenberg of Minerva magazine has suggested the disc was created by an expert forger soon before its discovery. Eisenberg states that he believes the object was manufactured to enhance the reputation of Dr Pernier who wished to compete with the incredible discoveries of fellow archaeologists on Crete Federico Halbherr at Gortyna and Sir Arthur Evans at Knossos. Sponsorship to fund Pernier’s continuing excavations at the Minoan palace site may also have been an issue. A thermoluminescence dating test would certainly prove whether the objects was made during the last hundred years or did in fact date to the Minoan period, but so far the Greek authorities have been unwilling to submit the Disc to such a test. Consequently, the possibility that the object is a forgery made in the early 1900s, using the limited knowledge of the Minoan culture available at the time, is perhaps a far-fetched but by no means out of the question scenario. In connection with the hoax theory, an intriguing find was made in 1992 in the basement of a house in Vladikavkaz, North Ossetia, Russia. This was a fragment of a clay disc smaller in size than the Phaistos disc but apparently a copy of it, thought the symbols on this disc were incised rather than stamped. There were rumours of a hoax, before the disc disappeared mysteriously a few years later and nothing has been heard since. Despite the apparent thanklessness of the task many researchers throughout the world still work away diligently attempting to decipher the Disc. But the extreme variations in the many purported translations have made scholars doubtful of any future success at decipherment, and indicate to many that while it remains an isolated example of its kind; the Disc can never be properly understood. We can only hope that future archaeological excavations in Crete, or perhaps elsewhere in the Mediterranean, will turn up further examples of this mysterious script. Until then the Phaistos Disc, now on display in the archaeological museum of Heraklion in Crete, will remain a unique enigma. Butler, A. Knight, C. & Lomas, R. The Bronze Age Computer Disc. Foulsham. 1997. Eisenberg, Jerome M. (2008). “The Phaistos Disk: one hundred year old hoax?”. Minerva (July/August): 9–24. Fagan, B.M. (ed). The Seventy Great Mysteries of the Ancient World. Thames & Hudson. 2001. Hagen, O. The Phaistos Disc Alias the Minoan Calendar. AuthorHouse. 2001. 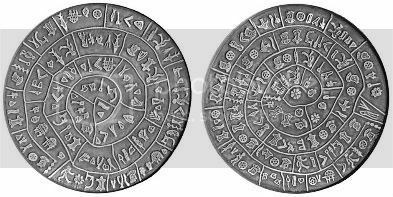 Phaistos Disc on ‘Interkriti’ web site. Powered by WordPress v 4.9.10. Page in 0.250 seconds.